The Ten of Cups is literally a picture of happiness. Its message is twofold: Not only do you have a clear understanding of happiness, but the things that make you happy are now within your reach. 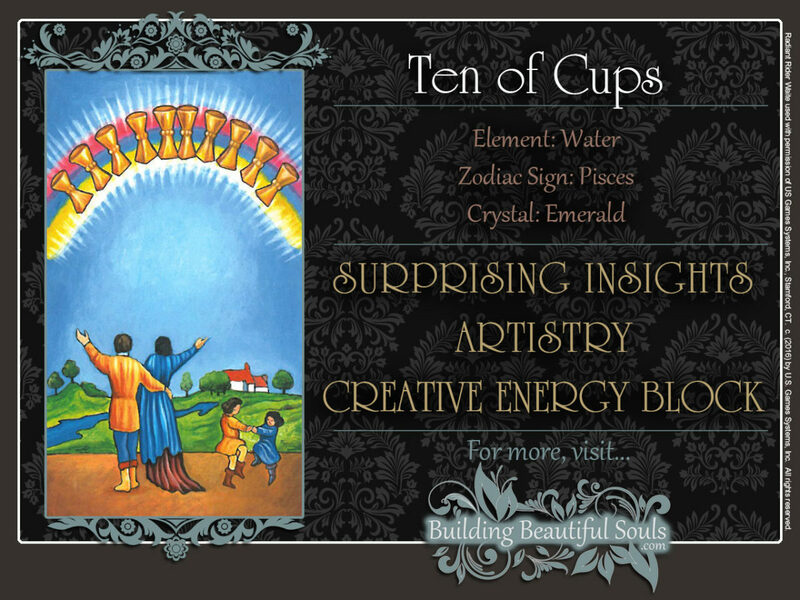 The bliss in the Ten of Cups card is physical, but it extends to all aspects of your consciousness. The rainbow across the top of the Ten of Cups is an ancient symbol of peace, prosperity, and divine favor. In Irish mythology, leprechauns hide their gold at the end of the rainbow and in Norse mythology, it is the bridge between the world of mortals and that of the gods. In Christian mythology, it symbolizes the covenant between humanity and the creator. The scene on the Ten of Cups takes place on a theater stage, meaning that it shows a psychological process. The stage’s backdrop is an image of happiness and success. A beautiful river runs through a lush green and fertile landscape past gently rolling hills on the Ten of Cups. It disappears right before the country mansion, symbolizing wealth and stability, nestled between the trees. It’s very similar to many people’s “roadmap to success” when they are asked to draw one in modern day self-improvement workshops. The children dancing on the right side of the Ten of Cups suggest that this happiness will be passed on to the next generation. The fact that they are dancing is a symbol of pure and innocent joy at the emotional level. On the Ten of Cups, the man and woman on the right represent happiness on the material level. He raises his left arm in joy, and she her right. They have almost physically merged into one entity – very much like those happily married couples that finish each other sentences. Even when they are speaking to their friends. Note how none of the figures in the Ten of Cups tarot card have a need to show off their accomplishments to the outside world, like the man in the Nine of Cups. In fact, the adult couple has its back turned to you. It’s enough that they know they’re happy. This is why Kabbalists call the Ten of Cups the Lord of Perfected Success. Are you ready to find out what “happily ever after” really means? Because you’re about to. Mars and Pisces are getting their groove on, and they’re steaming up the dance floor. Normally, this astrological combination brings out strong emotions. When they’re not properly channeled, that can spell trouble in even the best situations. But here in the Ten of Cups, the cups act like boilers in a cosmic steam engine. As fiery Mars infuses the waters of Pisces with energy, big things are being set in motion. Remember that the rainbow is not only a divine blessing, but also a divine promise! The 10 cups inside it symbolize complete emotional fulfillment. From the previous cards in the Suit of Cups, you have already learned that emotion is the fuel which energizes your life. If your heart isn’t in a task, it just won’t get done – and if it does, only in a shoddy manner. But if you put your heart and soul into something, you can move mountains! Okay, but what about prosperity? The Ten of Cups is all about that “very, very fine house with two cats in the yard,” like in the Cosby, Stills and Nash classic. Domestic bliss and financial success are some of the things this card promises. Oh, there’s more? You bet! On a wider scale, the Ten of Cups tarot suggests a feeling of being at peace with yourself, the world, and the universe. Arthur E. Waite has called the Ten of Cups the “repose of the heart:” a place of peace and restfulness. When you’re at peace with yourself, you can find immense joy in seemingly mundane things. For example, walking past the produce section, you are struck by the rich aroma of fresh tomatoes – and suddenly, you find yourself smiling. When this energy prevails, you have created the prefect, fertile soil in which friendships can blossom into kinships and lovers become soul mates. The Ten of Cups is an excellent card for any business or career situation, because it spells long term prosperity. When the Ten of Cups is reversed, the energy created by Mars in Pisces is still building up. But now it is either blocked, or it’s being misdirected. When all that pressure is rising but doesn’t have an outlet, it is eventually released explosively. And when we deal with emotional energy, this usually takes the shape of angry outbursts. Sometimes, the damage created during these outburst cannot be repaired. Therefore, it’s important to be very aware of your feelings, so it doesn’t get to this point. One of Michelangelo’s greatest masterpieces, the statue of Moses, has a huge disfiguring crack below the knee. No, it wasn’t a bunch of drunken soccer fans who vandalized the statue. It was the great artist himself! Moses set a new standard for realism in sculpting. In fact, the statue seemed so real, that Michelangelo believed, it would begin speaking at any moment. It didn’t, even though he commanded it to. Feeling snubbed, he threw his hammer at his own creation. The rest is history. Unrealistic expectations can move the needle into your emotional “red zone.” So cultivating a sense of clarity is crucial to your well-being – and safety. 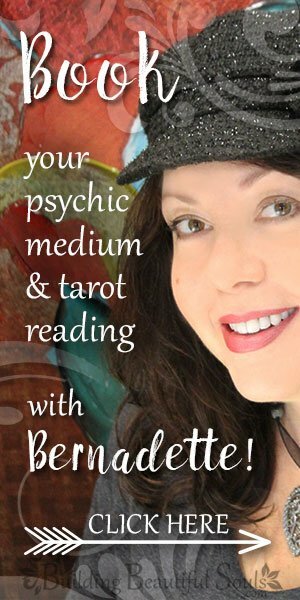 When your emotional energy is misdirected, it can manifest itself in other unhealthy ways. When this happens, this is usually because your actions do not reflect your values. For example, driven by your sense of responsibility, you work long hours to provide for your family. But in the process, you may neglecting your loved ones. “Tough love” is another example of how good intentions can go bad. Yes, sometimes it’s necessary to let a loved one fall on her face, so she can learn from her mistakes. But leaving her in the gutter when you know darn well she can’t get back up on her own has nothing to do with love. All tens in the tarot symbolize the completion of one cycle and the beginning of a new one. The energies of emotional fulfillment are now fully manifested. You cosmic gas tank is filled to the brim, so that your journey can continue! In traditional Numerology, 1 is 10 (1+0 = 1) so 10 is the Number 1 but vibrating at a much higher level.